Fiddler Ellen Carlson has a strong grasp on several musical genres. She has played with bluegrass, swing, western swing, country, Irish and square dance bands. Bluegrass Unlimited Magazine gave her a coveted highlight review for her solo album "People I Play With" as well as three excellent reviews for her band High Range, calling her "a talented musician." She teaches at numerous festivals and workshops including Fiddle Hell, Grey Fox, Joe Val, and Pemi Valley. 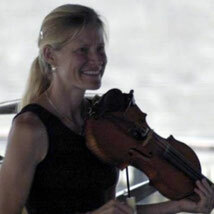 She started and leads the NH Fiddle Ensemble (featured on WMUR's Chronicle) with over 80 members. She is a member of the NH State Council on the Arts Teaching Roster. 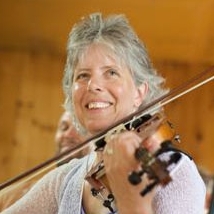 Kathy plays fiddle, electric violin, mandolin, and sings with the band The Buskers, a wild and fun, folky and funky band based in NH, and performs with northern NY musicians as Yellow Moon Jazz. She is adept at folk, swing and jazz, and has tried her hand at the Latin jazz scene as well. You can catch her performing across state lines, traveling with The Buskers or playing a variety of gigs in northern NY, including the Northern Lights Orchestra. She also has played many years for New England contra and square dances, was a member of The Fiddleheads Band, and Sweet, Red, Hot, and Sassy, and gives fiddle workshops in NH and NY.